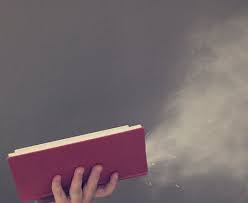 It’s Day 3 of my ‘Blowing the Dust Off’ series of blogs. 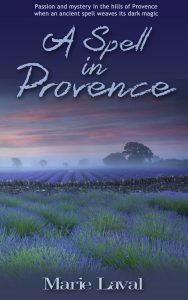 Today I’m welcoming fellow Accent author, Marie Laval, to my place to talk about her French romance, A Spell in Provence. People often wonder how writers find ideas for their novels. Although I can find inspiration from many different places – a song, a painting, a poem, or even a road map! – I can pinpoint the exact moment when I got the idea for my contemporary romantic suspense A SPELL IN PROVENCE. A few years ago I visited the lovely town of Cassis during a family holiday in Provence. We had an impromptu picnic lunch of baguette, ham and cheese on a village square and sat next to an old stone fountain with an inscription in Latin…and that was it! 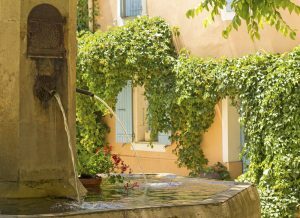 Fountains have a special place in the novel, but they are, and always were, very important in Provence. According to an old Provençal saying ‘Eici, l’aigo es d’or’, which translates by ‘Here, water is gold’ – and no wonder when you think how hot it can get in the summer and how parched the earth can be. Anyone who read the wonderful ‘Jean de Florette’ and ‘Manon des Sources’ by Marcel Pagnol, or saw the films, can remember the struggles and hardship the characters faced and their anguish of the characters when the water supply ran dry. A SPELL IN PROVENCE is set near Bonnieux in the Lubéron region of Provence, one of the many hill-top villages dotting the countryside. My heroine leaves England and buys Bellefontaine, a ‘bastide’ (an old farmhouse) she renovates and plans to open as a guesthouse….until eerie things happen and jeopardise her dream. The hero of the story, Fabien Coste, is heir to an old aristocratic family and has turned his ancestral manor house into a luxury hotel. Once again, the manor house is based on a real place – the castle in Lourmarin – but I have of course changed a few details. Another important setting in the story is the ancient village of ‘Bories’, which are stone huts dating back from the Iron Age, and which were still used as shelter by shepherds until a few years ago. You can also find isolated bories scattered in the landscape when you travel through Provence. Provence is not only a beautiful place, it also has a fascinating history – in particular ancient history – which is pivotal to my novel’s story line. Before the Greeks, and later the Romans settled there, the Salyens were the largest Gallic tribe. 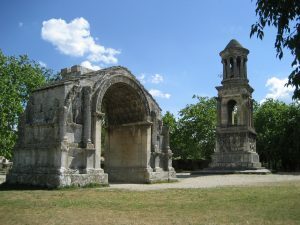 By the 6th century BC, their main centre was Entremont, which is located on a plateau above what is now Aix-en-Provence. There were other important centres, such as nearby Glanum. This settlement was dedicated to the Celtic god Glanis, and built around a spring known for its healing powers. The Salyens had the strange – some might say gruesome – custom of displaying the severed heads of enemies at the city gate. They left no writing but many statues of gods and warriors, some of them holding severed heads. 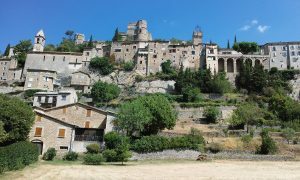 When researching and writing A SPELL IN PROVENCE, I loved surrounding myself with photos of hill-top villages, of old fountains and of lavender and sunflower fields. I grew up in Lyon and spent many holidays in the South of France as a child. Writing the novel brought back fond memories of playing in the sunshine, breathing in scents of herbs and flowers, and listening to the woody song of the cicadas. Originally from Lyon in France, Marie studied History and Law at university there before moving to Lancashire in England where she worked in a variety of jobs, from PA in a busy university department to teacher of French in schools and colleges. Writing, however, was always her passion, and she spends what little free time she has dreaming and making up stories. She writes both contemporary and historical romance. ANGEL HEART, THE LION’S EMBRACE, the DANCING FOR THE DEVIL Trilogy are published by Áccent Press, as is her contemporary romantic suspense novel A SPELL IN PROVENCE. 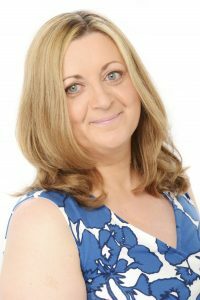 She also writes short stories for the World Romance Writers – Letterbox Love Stories and Escape to Africa – and has just signed a publishing contract with Choc Lit for another contemporary suspense novel to be published in 2018. Many thanks Marie. I’ve always wanted to visit Provence- I am inspired to head that way sooner rather than later. Don’t forget to come back tomorrow to read what Kirsten McKenzie has to offer us. Really enjoying this series Jenny. Thank you so much for your kind comment and your best wishes, Jane. You evoke a strong sense of place, Marie! I love France.